Due to their design, motorcycles are inherently more dangerous than cars. Motorcycle drivers are more exposed to the road and other vehicles, are more likely to be thrown from their vehicle, and are generally less visible than cars and trucks. Of course, every vehicle should obey all traffic laws, and understand the proper way to share the road safely with a motorcycle. Out here in Southern California, the weather is almost always cooperative if you want to take a scenic ride on your bike. Knowing how to handle your bike safely is the first step in avoiding accidents. Following are some motorcycle safety tips for new and seasoned riders alike. Even though you cannot control what is happening around you on the road, you can control what you are doing. 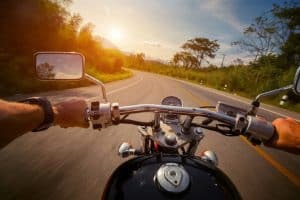 Read these ten tips for safe driving and reduce your chances of getting injured in a motorcycle accident. Take a safety course. Although safety certification courses are only mandatory for drivers under 21, it is never a bad idea to take a course if you are a new bike rider or to refresh your skills every few years. The California Highway Patrol offers a multi-tiered motorcyclist training course. Inspect your bike. Do not leave the house without giving your bike the once-over to make sure everything is working properly and is road safe. Wear proper safety gear. You should have a proper helmet, as well as a jacket, pants, and boots that will protect you from road debris. Stay alert. Keep on the lookout for distracted or possibly intoxicated motorists. They will not be looking for you. Ride within your skill level. If you are a novice rider, do not attempt expert maneuvers with friends who have more experience than you. Practice makes perfect, but do not push yourself too quickly. Leave open space. Know how much space your bike needs to stop and allow that much space (and more) when riding. Always keep alert for an “escape route” in case the vehicle in front of you suddenly slams on its brakes or a car swerves into your lane. Check the weather. Never go out for a ride without checking the weather report. Motorcycles have much less traction than a car, and the absence of windshield wipers cuts down on your visibility. If there is rain in the forecast, leave the bike at home. Know your route beforehand. If you are traveling somewhere new, look up the route and familiarize yourself with it beforehand to lessen distraction on the road. Never drive while under the influence of any alcohol or drugs. Here is a California-specific tip. If an earthquake occurs while you are riding your motorcycle, take appropriate safety measures. Pull over to the right, stay alert for overhead debris, and never take cover under an overpass, trees, or power lines. If you are on an overpass, get off as soon as you can. If you were injured in a motorcycle accident that was not your fault, the attorneys at Taylor & Ring can help. We tirelessly advocate for accident victims in the Los Angeles area. Call us today at 310.776.6390 or complete our contact form to schedule a consultation.